The public cares so much about the education ofits children that schooling frequently becomes a political issue as partisans propose means for improving schools and support them with appealing rationale. 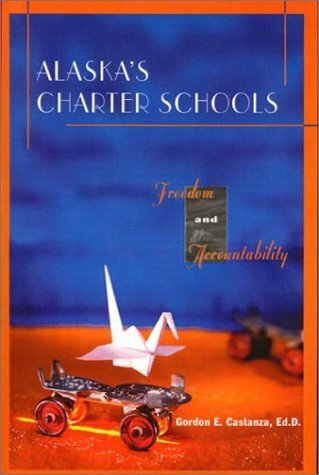 This has certainly been the case with the charter school movement. This book gets right to the point and one is never bored.It is a great read and I highly recommend it.Some of the true tales will set your hair on edge and it is amazing what people go through while being mauled by these huge bears.I'd give it more than 5 stars if I could. Larry is the real Deal! GREAT (and best of all, TRUE) stories of the Bear, get it, you'll not put it down till everyone in the story is safe! I live in Alaska and spent the summer camping with brown bears in Katmai National Park.I can say from experience that everything in this book is myth, grotesque fantasy, made up nonsense and lore.These types of book feed the false stereotype that bears are man eaters, which they are not.For example, hundreds of tourists a day walk with bears in Katmai National Park.The only fatal bear attack in Katmai, since it was opened in the 1920's, was Timothy Treadwell - and he was mentally ill.When bears are treated without violence, they are peaceful.This book is nothing more than propaganda by the hunting establishment.If people knew that children and the elderly walk safely with bears every summer, it would seem really pathetic to go out and shoot them.Read Grizzly Heart by Charlie Russell if you want to read a book about real bears. The author of this book, Larry Kanuit, is standing in front of my high school English class right now telling the students how he researches his books and how he writes. About myself: I was a journalist for 15 years before becoming a teacher; much of that career was spent in Alaska. I now teach in Bush Alaska. Most of my students are Native Alaskans. Reviewers who have stated that the author is inventing his stories are wrong. Period. Bear-lovers who say that the author is demonizing bears sound as if they have no real-life, consistent, up-close experience with bears. True, most bears leave you alone. Also true, bears are unpredictable and they will attack, maul, and kill you, without provication or apparent reason. Kanuit is explaining right now to the students how he interviews the victims (or survivors), uses police and fish and game documents, and essentially "writes a research paper." His research is good. I happen to know some of the same people in his stories, and their stories match the stories in the book. It's a good read. You won't want to walk into the Alaskan Bush without a good firearm, though. Larry Kaniut has made a career of writing white-knuckled real life thrillers.This book is no different.It's kind of like a car accident, once you start reading you can't turn your eyes away. 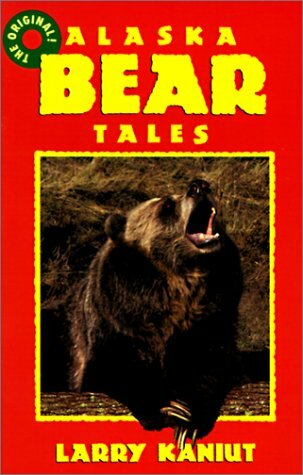 It's easy to get into the book but hard to put down.What better material than bear attacks to capture your imagination. There are lessons to learn from this book, but for the most part it is a collection of sensational bear stories presented for their entertainment value.If you are looking for a scientific look at bear attacks, this might not be the book for you - Try Stephen Herrero's Bear Attacks, Their Causes and Avoidence. If you want a book that throws one gripping bear attack after another, get this one.And if you didn't get enough from this book, try More Bear Tales by Larry Kaniut. Tired of his boring existence, sixteen Miles leaves his hometown in search of his "Great Perhaps" at a new boarding school. There, his newfound freedom, guilty pleasures and an enigmatic girl, Alaska, catapult him into a new life. But when Miles feels he's about to reach what he was looking for, a sudden tragedy threatens to take it all away. Debbie Miller moved from California to become a schoolteacher in Arctic Village. From there, she took numerous treks into the Refuge. This book captures her experiences and impressions. Debbie is a graceful writer who weaves a story well. Occasionally she gets a little preachy about the need to protect the Refuge from development, but for the most part her writing is informative, entertaining and entirely readable. I found the last chapter absolutely gripping as she describes taking her toddler to camp in the Refuge. As a parent of young kids, I cannot possibly imagine this--it's hard enough to travel there as an adult without kids, but bringing a kid just seems overwhelming. But her stories, especially the interaction between her daughter and a wolf, were moving and emotional. The book did a great job giving me a preview of life as a visitor to the Refuge. This is the seminal book about the Arctic National Wildlife Refuge, written before the Refuge was "cool," and it is the template for all of the books that follow it. If you're going to read only one book before going to the Refuge, this is the one. Strongly recommended. The book jacket states the book is a passionate and vivid account of her trips into the ANWR, and it certainly is that.Having been in many of the same places, and even flown with some of the same people, I can make an immediate connection with her book.This book is a first person account, not a naturalist documentation.Some of her trials and tribulations make for very interesting reading, and makes one glad sometimes that they did not have to trek in some of the places.Her account of some of her hiking in the rugged Romanzof mountains sent chills up my spine.A weakness perhaps is after almost each description, she states what is at risk by allowing drilling.Sometimes that gets in the way of the journey.However, the last section of the book outlines the history of the preservation attempts, and the very real dangers of oil development to such an unspoiled wilderness.This book is a personal account and not a detail as to the intricate inter-relationships among the flora and fauna, and it was not meant to be.I enjoyed the book for what it is, and that is a personal story.I wished she had described in a bit more detail her time in the arctic when the colors started to appear as fall approached.Having been along the Jago River in the 1002 lands at the height of the fall colors, it is something that cannot be imagined in advance.One can never believe such a landscape of apparent green can take on so many colors.A perfect companion book to this would be that of E. C. Pielou, A Naturalists Guide to the Arctic.With Pielou's book, one can gain a fuller understanding of the tricks of light in the arctic, and the interdependency of the animals with the plantlife.Oil company executives will not like this book.Most others will enjoy reading her accounts. I love Debbie Miller's book Midnight Wilderness about the Arctic National Wildlife Refuge.Her journal writings, with detailed land references, eloquently paint a portrait of this pristine area and how unique and beautiful this remote land is. I enjoyed reading about all the animals and birds that live and migrate there every year, and about the people who depend on this area. This book educates us on the oil development controversy and why it is vital we continue to fight in protecting this special land for now and future generations. This book is truly the ultimate reference book for the Arctic Refuge and I highly recommend it to all. Debbie Miller draws from her journal and from her heart as she recounts her explorations of the Arctic National Wildlife Refuge, the last great wilderness area left in the United States.Few people have actually stepped foot on this northeast corner of Alaska, but by reading the words of Miller, one can be transported to this rare and magical place.The book, written primarily during the 1980s and updated in the current edition, is informative and inspiring.She effectively intersperses relevant historical and scientific facts with her own personal observations and love for the region. This digital document is an article from Alaska Business Monthly, published by Thomson Gale on June 1, 2006. The length of the article is 1909 words. The page length shown above is based on a typical 300-word page. The article is delivered in HTML format and is available in your Amazon.com Digital Locker immediately after purchase. You can view it with any web browser. Title: Building Alaska's future: apprenticeships and school programs designed to train skilled construction workers. The best Michener work I've read so far. (othes I have read include Tales of the South Pacific, Return to Paradise, Sayonara, Chesapeake, The Bridges at Toko-Ri, and Hawaii) So what makes it so good? 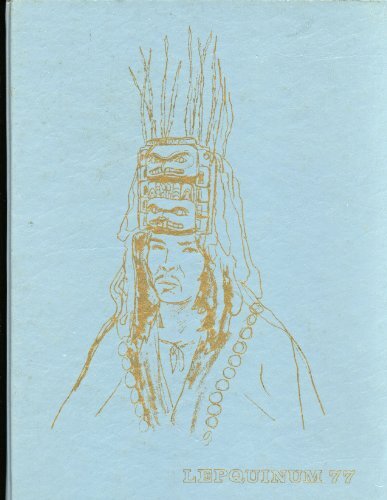 Michener selects excellent historical highlights to give us a sense of the place: Russian exploration of the Aleutians, gold rush boomtowns along the Yukon River, Eskimo villages in the Arctic, salmon fisheries in the southern panhandle, and pipeline construction in the central interior. I also liked his handling of the philosophical aspects of settlement- particularly in the 1800`s. On one hand, trade and development could only begin with adventurous, entrepaneurial spirits, working independently -free of micromanaging government or corporate home offices. Many of these people were in one way or another disenfranchised from mainstream American or Canadian society (e.g. Mr Klope in Dawson City). For them, Alaska was a a fresh start in a land culturally and physically apart from the rest of the world. Rugged, self-reliant figures carved out empires for themselves, according to their own rules, and guided by self-interest. This view romanticizes Libertarian aspects of frontier life; but Michener tempers this well with the downside of lawlessness: gangs and renegades like Soapy Smith terrorized honest citizens like Tom Venn. Michener's delivery of these issues elevates the entire book above mere storytelling, or the recitation of historical facts. It is historical fiction at its best. 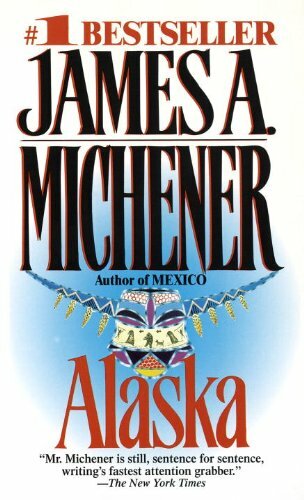 Alaska was published in 1988, late on in James Michener's career, when his experience and craft were at their peak. Despite its heft, it reads fast. In fact, I would place it on par with Hawaii for readability. Hawaii comes across well because of the author's obvious love for the subject; he had personal ties to the Islands. 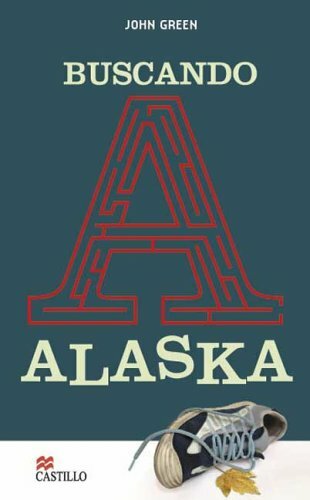 Alaska`s readability, I think, is more attributable to his growth as a writer. Since the narration continues over several centuries, there are by necessity a lot of transitions as old characters die off, and new ones are introduced. Also, since Alaska is such a big place and Michener is eager to show us so much of it, there are a lot of shifts in setting. Alaska's transitions are smoother than Hawaii and Chesapeake's. Those earlier works were more compartmentalized in time and space... characters would be introduced, play out their drama, and then the close of their era would end each chapter. Subsequent chapters would start fresh in a new time and place, without much carryover of characters (with a few exceptions, like Hoxworth in Hawaii). In Alaska, Michener employs a lot more carryover to link chapters. Staggering character entrances and exits creates a much more natural- feeling rhythm to the work. He also deftly blends space and time transitions. Take, for example, the story arc of Ciddaq: her movement from the Aleutians to Sitka early in life transport the story's physical setting, and then her life in Sitka raising her son (Arkady) moves the timeline smoothly into the next generation. The three detailed maps are sufficient to show all the places mentioned in the text, which is an improvement over past Michener works. Better still, pages vii-viii of the foreword lay out clearly which elements in the story are fictional, and which are faithfully-depicted historical fact. Every work of historical fiction should have this. If an author wants to mix the historic record with fiction, I'm willing to grant a lot of artistic license, but at some point, I want to be able to sort out which was which. It can be fun to read historical fiction in preparation for travel, but you don't want to be the idiot at the back of the tour group, asking "Can we see the place where Luke Skywalker and those peasants stormed the Bastille?" I learned so much I never knew about the migrations of people and animals, about the climatic changes in Alaska and about the Russian presence there.I learned a lot I wished I didn't learn about the truly horrific exploitation of native populations, but I suppose that goes with world history. But most of all, this book was a wonderful distraction from daily life. It was, for a short time, my get-away.It's hard to find a good book that just takes you away from thoughts of work and life and Alaska is just such an adventure to get lost in. I am enjoying this book but it is long and because I only have a short time to read each day, it will take me a while to finish it.It is very interesting.There is a lot of historical information in this book that will create a good background of knowledge for me when I take a trip to Alaska in the near future. This digital document is an article from New York Times Upfront, published by Scholastic, Inc. on April 5, 2004. The length of the article is 8753 words. The page length shown above is based on a typical 300-word page. The article is delivered in HTML format and is available in your Amazon.com Digital Locker immediately after purchase. You can view it with any web browser.